For those that do not want to read through it, can’t say I blame you really but here is my simplified version of why they feel this latest judicial review has validity and I must say on reading through it I was actually quite shocked, especially as the two names that jumped out instantly were Jessica Seymour QC and Patrick Green QC, who I am sure where involved in the Gina Miller case, which is a rather important factor in this but I will come to that later. The crunch argument being put forward is that Vote Leave have been found to have broken electoral law by overspending in their campaign throughout the EU Referendum. Now initially I did think, well you have to be somewhat gullible not to have realised that Vote Leave were always Cameron’s chess pieces anyway and didn’t actually put forward an overly convincing campaign, just take a look at the @Vote_Leave timeline on Twitter and count the number of victory cheers when we won, it will not take you long because there were not any and the look on Boris Johnson’s face the day the results came in really said it all, you would have thought someone had just stolen his train set. The £350 million on the side of a big red bus was done to distract people away from real issues such as us having no influence in the EU and as such there could never be any kind of reform, contrary to what it says on the banner at the top of this article. So it is actually a little difficult to see how Vote Leave spent over £7 million on their particular campaign, Cameron who went around with the StrongerIN campaign spent £9 million of taxpayers money sending a leaflet out telling people to vote Remain. Apparently, that didn’t count though, as neither did all the money that Soros and the EU threw into the EU Referendum Remain campaign. When I see things like this it is sometimes hard not to believe there are some deliberately trying to cause civil unrest in this country but that is another story, back to this wonderful idea they have for a new judicial review that they already seem to believe will stop Brexit in its tracks. Vote Leave overspent so that means it was an unfair decision to invoke article 50, the prime minister was obviously hoodwinked about Brexit and so should, therefore, be cancelled altogether, so that we all stay in the EU and be good EU citizens. That basically seems the crunch of what is written, most of it is repeated nonsense about criminal conduct of Vote Leave and how the prime minister was fooled because of it. If it wasn’t so pathetic it would be amusing but I actually do think they believe every word that has been written. Although plainly oblivious to the fact that very few who voted Leave did so because of a big red bus with £350 million on the side of it, nor was it Theresa May’s sole decision to invoke Article 50. It is actually quite insulting to the 17.4 million people who voted to leave, most of whom did so because of British sovereignty more than anything else. These Remainers simply cannot accept the fact that many of us do actually have faith in Britain’s own capabilities, much more so than we have faith in a corrupt European Union, that we believe we should never have joined in the first place and it has been proven that Heath did lie to everyone in 1973, so there is a rather strong stench of hypocrisy whilst reading between the lines of what has been submitted. However, the most dumbfounding part of it all for me was the simple fact that they seem to be totally unaware that the Gina Miller case, you know the one that she did win and everyone shouted about it being such a great victory for Remain. Well that forced parliament to create the European Union (Notification of Withdrawal) Act 2017 and this, in turn, means it was a decision by parliament to invoke Article 50, not the government and that was done as per our constitutional rules which fully legitimised the invoking Article 50. That Gina Miller judgement actually made the EU Referendum result completely irrelevant from that moment on and as you cannot have a judicial review on an act of parliament that means this judicial review has to be the most pathetic argument I have seen put forward throughout the whole Brexit debate. It is simply beyond belief that leading QC’s such as Jessica Seymour and Patrick Green, who were both involved in the Gina Miller case (I believe), did not pick up on this obvious flaw in this latest attempt to thwart Brexit. I honestly cannot see that particular judicial review getting accepted, so before any of you start throwing money at it, I would hold back to see if it is rejected first. I doubt very much they will be giving out refunds. Of course, being just a mere law student about to start my third year, I might have it all wrong, I may have missed some crucial part that somehow justifies Adam Wagner jumping around in excitement on Twitter believing this is the one that will stop Brexit but I do have a very sneaky suspicion that the precedent set in the Gina Miller case will be the defining factor in ensuring Brexit happens and this latest little bout will have a rather embarrassing conclusion for those who have put their names to it. So I put this blog out last night and then started to look around to see who was actually behind this latest Judicial Review and soon got into a bit of a Twitter bout with @BremainInSpain who tagged in @SueWilson91 the person who is the lead name on the judicial review, BIS seemed completely clueless on many things regarding the EU and the law then suddenly @ZAdamsGreen piped up, shouting about how Brexiteers were to blame for expats losing their EU Citizenship rights. 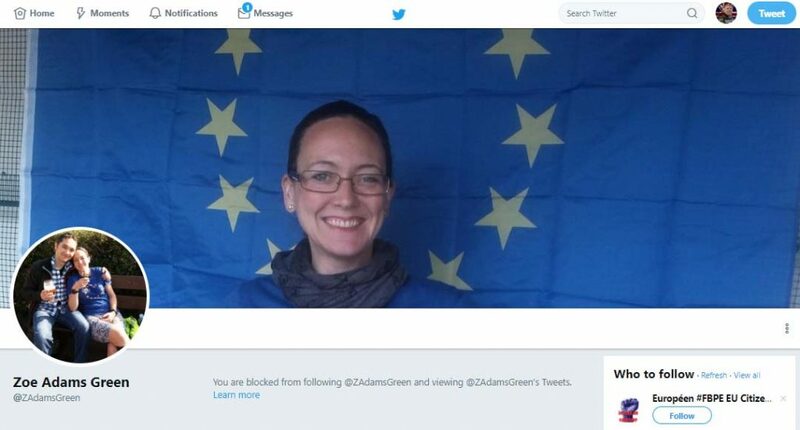 This was obviously in some kind of defensive move and that was enough for me to do a quick check on Zoe Adams Green and I quickly found out she was actually married to an Italian and lives in Italy, so would have no problem whatsoever gaining EU Citizenship, after 6 months of residency. 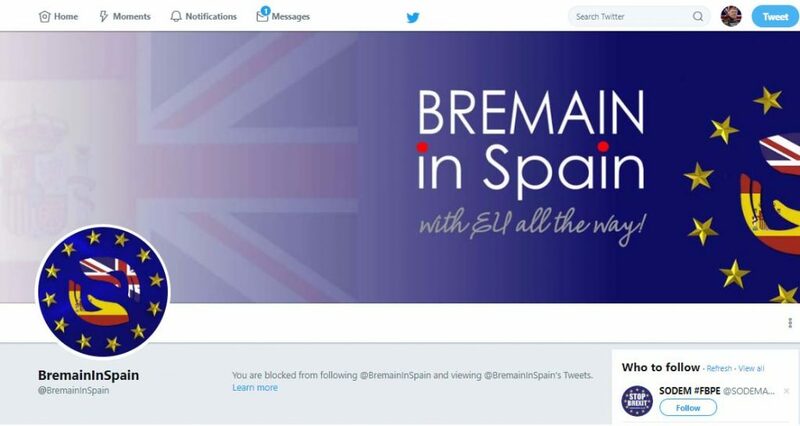 It also became very clear she was the person behind @BremainInSpain, which is a little confusing as she actually lives in Italy but hey oh. Now I must admit when it comes to Ex-Pats and Brexit I really have very little time for them, simply because I think when they chose to leave the UK for a better life, they lost their right to argue about what happens in the UK. Now, I know some will disagree with that point of view but it is not one I intend to change because for me it is very simple, they chose to become Ex-pats and I have no wish to become one, which happens to be why I fight for Brexit. Anyway, Zoe Adams rapidly started to lose the debate and I pointed out that the EU had taken steps to make it easier for UK citizens living in the EU to register as EU Citizens and even supplied this link below which proved she was lying even if I hadn’t found out she married an Italian. 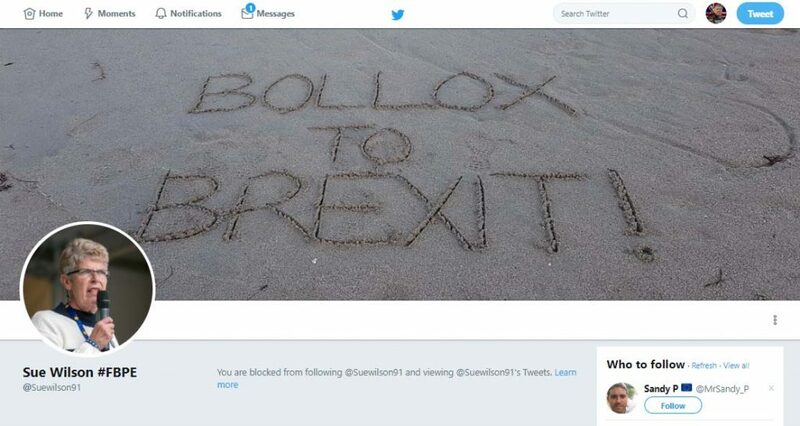 Telling porkies seems to be a common trait of Remainers when faced with clear facts which is never a smart move when those lies are so easily disproven. Of course, I received the usual response whenever you catch Remainers out… and all three immediately blocked me on Twitter but you can read the thread by clicking on the link below… I will let you decided for yourselves if the block was warranted or not but in fairness being blocked by ExPats who are demanding we stay in the EU will only ever result in me questioning my atheism. I can tolerate Remainers who do actually have a dog in the race but ExPats simply do not and as far as I am concerned should keep out of it. What is very clear though from looking through the timelines of those three accounts (before they blocked me) is they are certainly pushing the crowdfunding for this judicial review, and as I believe it will be rejected as soon as it is read, that is a bit concerning. Especially considering their rapid response to block me, I do strongly suggest that sensible people should wait to see if the Judicial Review is accepted before ever sending any money, to fund this because I very much doubt it will ever reach the courts. Feel free to click on any of the pictures below to see these ExPats in action on Twitter, I certainly would not trust them to go to the shop to buy me a lottery ticket and I suspect they will raise a nice tidy sum from simply promoting this judicial review idea. Do keep an eye on this blog as I will be updating it with information regarding the Judicial Review as it progresses and it will be interesting to see how many more involved in it, end up blocking me for pointing out the truth. Why people need to ENGAGE with each other…	The ‘No Deal Brexit’ Scaremongering Nonsense!